and with the most used desktop by opensuse user (kde) what do you get? 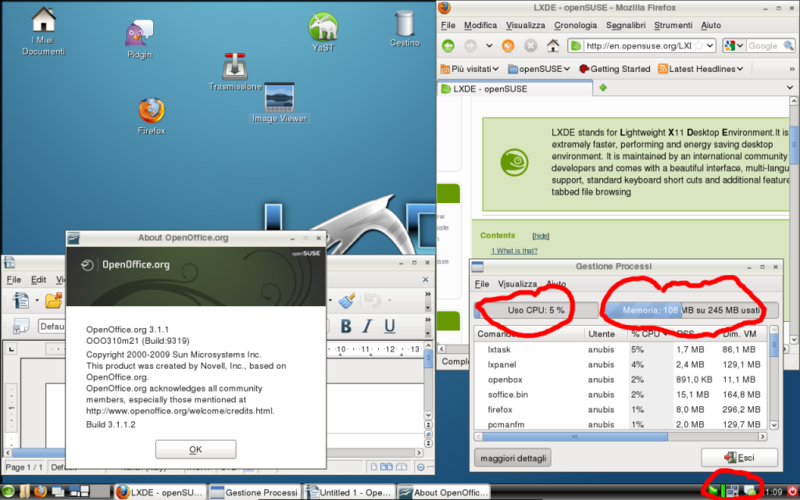 There is no good reason why OpenOffice or Firefox should be significantly different in KDE than in LXDE. I mean, they are still the same applications, aren’t they? That blog entry is about LXDE, a NEW desktop enviroment that want to be as lightweight as possible, you cannor use GNOME nor KDE on a pc with less than 256MB ram, with LXDE you can. For Everybody else, the news is that you CAN finally MOVE your Desktop Icons every where you want on the desktop! Where to get the patch for the desktop icons ? It’s possible to get this patch without need a login and password?! I found the pcmanfm src rpm package that contains the patch. I’m ArchLinux user, but I’m going to test this new release of OpenSuse as soon as possible. yes, where can i download it? and when i install the previous version (openSUSE-LXDE Live CD 1.0.0) will i get all the updates to 11.2? i will release 11.2 live cd soon. any way all LXDE packages are already available for 11.2, just use the same repo always.